By pure definition, to be sustainable means to ‘uphold / defend’ or ‘is able to be maintained at a certain rate or level’, but how does sustainability fit into the mining sector-an industry that is predominantly known for generating huge profit yields with equally huge negative environmental and social impacts. The Brundtland Report (1987) ‘Our Common Future’ originally defined sustainable development as ‘meeting the needs of current generations without compromising the ability of future generations to meet those needs.’ Some would argue that mining cannot be synonymous with sustainable development, however, mining is an integral part of economic growth for many countries and thus there needs to be a reconciliation of goals towards sustainable development and sustainability as a whole for all parties. In the context of mining, Sustainable Development needs to be integrated with social and environmental sustainability where the overall goal is to reconcile economic activity with social concerns, effective governance systems and environmental integrity. This means serious education, awareness and enforced policies to pro-actively minimise damage. 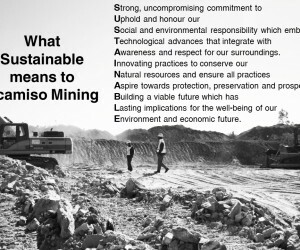 “Although mining results in growth of the economy, there is a very narrow balancing act in ensuring an equitable distribution of costs and benefits, that minimises the harmful effects of mining without destroying future opportunities for life, well-being and financial growth.” says Ncamiso Mining MD, Mr Fikile Mashinini. Awareness and respect for our surroundings. Aspire towards protection, preservation and prosperity. There is a cry out in the industry for meaningful action that will make a tangible difference in the future world. 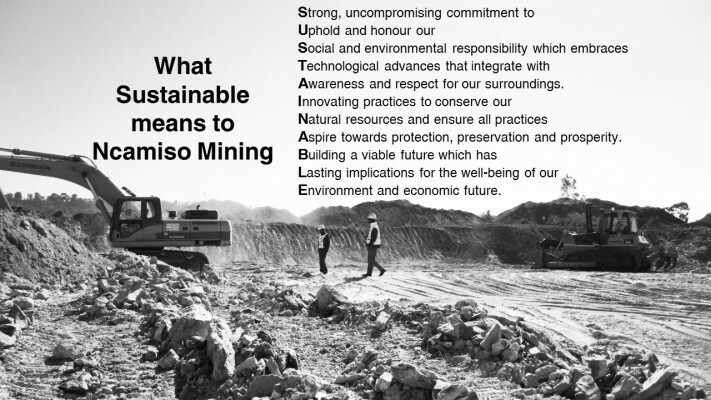 ‘No mining house is perfect, but if we all set out with the same intentions and actions for lasting good and a positive impact to all concerned, then we are on the right path’ says Ncamiso COO, Tshego Motsoenyane. The International Council on Mining and Metals (ICMM) have set out a framework for best-practice to achieve sustainable development in the mining and metals industry. As a business, Ncamiso embrace and apply these principles to put their values into action. Remain ethical and operate with integrity and transparency to all stakeholders, staff and communities. Respect human rights. Engage with employees and the local community to understand their needs and address their concerns. Exercise local procurement to the furthest viable extent. Seek to understand and plan for the potential of the land and community post mine closure and ensure to integrate sustainable development across all possible avenues. Implement sound risk management strategies. Adopt a zero tolerance to corruption policy. Have clearly defined objectives and accountability to contribute to social, economic and institutional development. Constantly measure, monitor, review and evaluate. Constantly seek to improve environmental impact, health and safety performance. Reduce the mining footprint and encourage responsible practices with waste and resources.